Clear Choice Office Solutions remains your reliable provider of cubicle parts and panel extenders not only in Houston, Texas; but across the nation. We sell superior quality, durable cubicle parts to fit a wide variety of workstations. Whenever you need a cubicle part to replace or update your existing cubicle, we have the perfect solution for you. Furthermore, we have cubicle parts and panel extenders for various cubicles, irrespective of the brand or manufacturer. 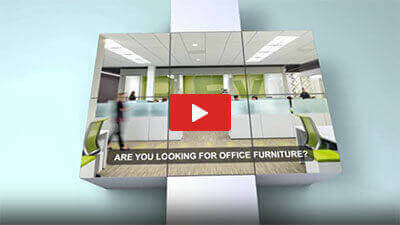 We can supply your office with cubicle parts from some of the leading brands in the furniture industry including Herman Miller, Steelcase, Haworth, Kimball, Knoll, Teknion, Allsteel, and Trendway. In addition, we provide affordable cubicle parts in Houston TX. We provide these cubicle parts, panel extenders, and other systems replacement items at a relatively cheaper rate when compared to manufacturer’s prices. Whether you need to replace some worn out brackets or those lost in a relocation move, we can make them available for you. Even if you are looking for new cubicle partitions to upgrade your cubicle for a more sophisticated look, we have a huge selection of used and new cubicle parts for you. With us, you can get your systems furniture looking new, attractive, and functioning properly once again. However, we do not compromise our integrity. All our cubicle parts are manufactured using high-quality materials. These cubicle parts feature form and function. They are strong, durable, and long-lasting. 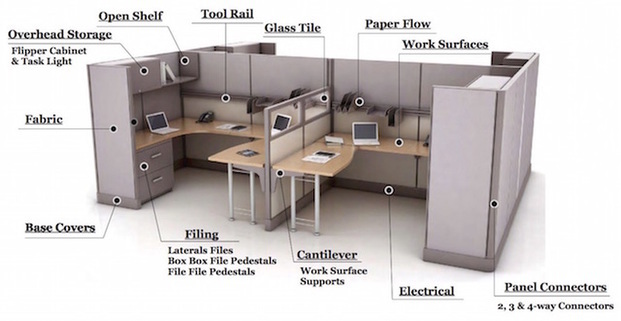 Our cubicle parts will definitely serve your office furniture needs for many years to come. Our FRAMEwall room divider solution features a modern room divider screen system expertly designed to add creativity, sophistication, and more privacy to a wide range of spaces. Whether you are looking to divide your living and working area, our FRAMEwall room divider solution are perfect for you. The Flexwall room divider solution is a lightweight, flexible partition screen that is brilliantly designed to maneuver effortlessly and conform to practically any space. The Flexwall features colorful fabric panels that can be customized to your style, preference, or taste. Also, Flexwall does a great job in absorbing sound. With a simple Flexwall solution, you can enhance the design of your environment while eliminating distraction, noise, and increasing privacy. Clear Choice Office Solutions is one of the largest suppliers of cubicle parts and panel extenders to businesses all over Houston, Texas, and every other city across the nation. We sell cubicle parts, panel extenders, and other systems replacement parts to fit a wide variety of workstations from some the industry’s leading brands, including Steelcase, Herman Miller, Haworth, Knoll, Allsteel, Teknion, Kimball, Trendway and so forth. No matter the brand or manufacturer for your office cubicle, Clear Choice Office Solutions has the perfect replacement part for you. Enhance the efficiency and productivity of your workers with our wide range of cubicle panel extenders from OBEX. These panel extenders fit seamlessly on top of your existing panels. They are perfect to improve workers’ privacy, concentration and eliminate distractions. Furthermore, these adjustable extensions are flexible and versatile. They are designed to fit standard panel systems from all the major office furniture manufacturers. Irrespective of the brand or manufacturer of your office cubicle, our adjustable cubicle panel extenders from OBEX will fit perfectly. In addition, these innovative product are perfect to improve the function and value of your current panel system. Your employees will highly appreciate the added concentration and reduced distraction or noise provided by the new panel additions. At Clear Choice Office Solutions, we offer you a huge selection of easily adjustable desk mount privacy panels to help increase your employee privacy. These desk mount panels can be easily attached to employee desks. What’s more, our desk mount privacy panels are ideal for increasing the cross-functionality of your desk set-up. They will improve employees’ efficiency, performance, and results. Most importantly, they do not damage the existing furniture. Whether you need desk divider panels for classroom testing or want more enclosed office space, these desk mount privacy panels are the perfect solution for your work environment. You can choose from our huge selection of custom colors, frames, and fabrics. They are guaranteed to enhance your workstation in ways that will surpass your expectations. For employees that require privacy below the work surfaces, our Modesty Panels from OBEX are the ideal solution for you. These universal brackets are easy to mount under most tables and desks. They also feature various sizes and colors. At Clear Choice Office Solutions, we pride ourselves on delivering superior quality cubicle parts, panel extenders, & room dividers. Our cubicle parts are perfect for updating your office cubicles for a more sophisticated look. From used cubicle connector to new cubicle partitions for your entire workspace, we have the huge selection of affordable, top quality cubicle parts you need to help you complete projects of all sizes. What’s more, our team of well-experienced experts will provide you with top class office panel extenders and room divider solutions. This will help increase employee focus and eliminate distraction. The result is enhanced efficiency, productivity, and performance.